I am proud to have been in the audience at the Durham Marriott Hotel Royal County for Sharon Sutton’s recent TEDx Durham talk. 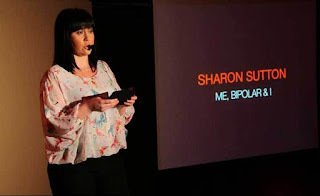 In a powerful and moving speech, reproduced here in full, Sharon gives an insight into what it’s like to live with mental illness, and how she has found her purpose and passion. So, what do you do when you get a diagnosis of Bipolar Disorder? When I got mine in 2013, along with my prescription for a box of mood stabilisers in tow, I didn’t know what to do, whether to tell anyone, or what was to lie ahead for me, but what I did want to know, was what it meant, and, what I was going to do about it. For about a month, I kept relatively quiet about my Psychiatrists recent conclusion, however, eventually it appeared to be no secret. For anybody that is unaware of what Bipolar Disorder is, it was formerly known as manic depression and it can affect your moods by swinging from being in a depressive to an elevated state. It’s common and can affect 1 in every 100 adults. Many people like myself are usually diagnosed when depressed. Bipolar disorder results in just over a 9-year reduction in expected life span, and as many as one in five patients with bipolar disorder succeeds in taking their own life. Although bipolar disorder is equally common in men and women, research indicates that approximately three times as many women as men experience rapid cycling. Bipolar disorder affects nearly 6 million American adults, or about 2.6% of the U.S. population age 18 and over every year. Side effects can include a range of symptoms from having difficulty in concentrating and remembering things, difficulty sleeping, hallucinating, self-doubt, lacking energy, to being irritable, easily distracted, talking quickly, being overjoyed, hyperactive and having racing thoughts. Mania is an extreme elevated state which can include extremely risky behaviour, but I myself have never experienced it. I have experienced hypomania though. In some of my depressive states I haven’t left the house for weeks except for school runs, I’ve cut off the outside world and barely looked after myself. On the other hand, I ‘ve jumped up and down on the bed randomly in the middle of the night being full of adrenalin along with my bedroom window wide open whilst singing loudly to the birds, all while not caring who is listening or who I may potentially annoy. So, you’re probably wondering how all this came about. Well, I think that my mental health problems began when I was approximately 16. I had never known much middle ground in my life, but what I knew, as did others, was that, I was different. By now I was told that I stood out from most people and I liked it. I never once wanted to blend in. Unfortunately, a year before I moved out, so I will have been about 15 years old, I spent mixing with the wrong crowd of people by getting into trouble and I was up to nothing but pure mayhem. I’m ashamed to admit that I think I became a dreg of society within that space of time. At just 16 years old I moved out of the family home and spent 9 years in an abusive relationship with a psychopath. I was bullied, spat on, conditioned, spoken to like I was worthless, controlled, stalked, mentally, financially, sexually and physically abused and so this was the beginning of a downward spiral in my mental health. I sometimes had knives held to my throat and at one point I even had a fractured left hand and bruises on my body. It wasn’t easy to walk away from the life that I had and it was easier to put up and shut up. Whilst I was in this relationship, age 19 by now, I took on a Fish and Chip shop for 6 years with help from family members to buy it. Not one of my best idea’s, but most definitely a learning curve I must admit. I had a love hate relationship with my business and I say this because it was what put food on my daughter’s plate and what I wanted at the time so that I could have more stability in my life. On the bright side, my shop was listed as one of the top 50 in the UK and the only one north of Whitby to get the Sea Fish Industry Authority Award; it was ranked alongside a celebrity chef’s fish and chip shop and mentioned in numerous national newspapers and magazines. Radio interviews followed as did photographer’s randomly turning up at my shop to get their share of photos of myself with the award. To say it was rather surreal was an understatement. It’s on my wall in my house right now and I am proud of that achievement. Nevertheless, the roller coaster of my life continued. I was about 7 months pregnant at the time with my eldest daughter and my life literally changed overnight. After my ex tried to unsuccessfully take mine and my daughter’s life in a car crash, I felt like I had to finally take matters into my own hands. However, I found myself being too scared to move on in my life. So, I drove in front of a lorry head on instead. I clearly didn’t know what I was thinking at the time. Luck was obviously on his and my side that day. The only thing that stopped me from driving into the lorry was the driver flashing his headlights and at that moment I swerved my car to miss it. I was alive but sick of my life. I didn’t want to die, I just wanted my pain to end. It was more of a cry for help. I felt exhausted in every way and I wanted to leave the world behind as I thought it was my only way out. From the outside looking in it would have appeared that I had everything. A family, a business, a house and a car. This was maybe the case, but behind closed doors it was a different story. A house it was, but a home it was not. My then partner never did find out about my suicide attempt and so my life went on everyday like Groundhog Day. After some time, I finally dared to move on. I sold the business and moved house with just me and my eldest daughter. I spoke to the Police about my violent past and unfortunately with my case being historic by then and the fact that I had little proof of what I had experienced they couldn’t really help me. I wanted to help others not to go through what I had, so I started work as a Police volunteer in Domestic Violence, Adult Vulnerability and Child Abuse Investigation. I sometimes spoke to victims, signposted people for help and I typed hundreds of transcripts of Police interviews ready for court. I loved what I did. I met someone else, moved house again, had another child and eventually started married life. I was in the relationship for about 4 years before we parted ways. My complicated personal life continued. Disastrous toxic relationships followed, but at the same time without what has happened in my life I wouldn’t be here and where I am today. It’s now 2017, roughly ten years since I was at my lowest point in my life, now I’m stood telling you my story, pleased that I failed at my suicide attempt. In just over 3 years what have I done with that diagnosis then? Well, to aid myself to getting on the path to a better life I decided to teach myself what it was all about and the rest is basically history. From then I set up a Facebook page called Me, Bipolar & I to help people with Post Traumatic Stress Disorder, Depression and Bipolar Disorder, of which I have experience all. Today that page has over 12 thousand followers worldwide, is recognised by The International Bipolar Foundation in the USA, and is looked at by Police forces, Psychiatrists and all sorts of different people. From there I’ve looked for things that I can do and be part of. I’ve been involved in TV and scientific research, co–delivered Bipolar Disorder classes in Recovery College and University, helped raise awareness by speaking to support providers, met celebrities and spoken about mine and their experiences to them, contributed to clinical assessments, educated myself, done interviews, worked in a mental health hospital and community mental health team, become a member of different mental health charities, joined a drop in group as a volunteer, met with staff in local businesses to try and educate them, had my thoughts put in front of parliament members and even won the former Deputy Prime Minister’s Mental Health Hero Award in 2015, out of 900 nominations there were approximately 40 UK winners of which I was 1 of 3 in the North East of England to get it. The award is on my wall at home along with my Fish and Chip shop award. I try to be an advocate by speaking out, blogging and campaigning by breaking the silence, and if more people, like myself, spoke out about mental illness there would be a lot less stigma and discrimination within society. I speak for the silent, but together we can be stronger in numbers. You know, when we learn how to work together versus against each other, things might start getting better. So, after years of being on different medications I have been totally free of them for over 8 months now and I find that weight lifting and boxing benefit me too. I help my new partner and he helps me as we both have experience of mental health problems. I don’t let Bipolar Disorder get in my way with what I want to achieve. It’s not an excuse but an explanation of my behaviour, and just sometimes, having bipolar disorder means waking up not knowing whether Tigger or Eeyore maybe making my decisions for me! It doesn’t rule my world nor define me, but, it fuels my passion and inspires me. To be honest, without Bipolar Disorder I don’t think that I would be as mentally strong as I am today. I find it a curse at times, but more definitely a blessing, and from it I now have a passion and a purpose. If there is one thing that you could take away from this speech, then please remember to try to see the person and not the diagnosis. Choose your hobby as your job. To go somewhere even if you have no idea where the road will take you. Choose to be excited about your next idea whatever it may be. To move out of your comfort zone. Choose health and to look after yourself. To help people even when you don’t want to help yourself. Choose to be the person that you would want to know. To smile at the person who isn’t smiling back at you. Choose to be different and to stand out. Not to be consumed by everything. Choose your thoughts not to be controlled by society. Not to be told what to do. Choose not to let trivial things get to you. To be inspired by whatever may inspire you and to laugh when it’s totally inconvenient to do so. Choose to be the person that everyone wants to genuinely know. To love the life you live. Sharon is a multiple award winner and volunteer in the field of mental health. Sharon speaks of her illness and how it affects her yet she explains how she lives with it and how she doesn’t let it defeat her daily. After a diagnosis of Bipolar Disorder, she went onto researching the condition to find out what it was about. She is a blogger for major online newspapers and is an advocate and ambassador for the silent and standing for the broken to raise awareness by helping thousands of others worldwide. Follow Sharon on Facebook and Twitter, and on her author page at Northern Life Magazine.